The Moon (XVIII) represents both illusion and disillusion. The eighteenth card of the Major Arcana indicates a strong sense of understanding of both the present and future, but it also leaves those who draw it vulnerable to unexpected changes of course. The English Rider-Waite deck emphasizes the moon’s duality. In the distance, two identical towers appear on either side of a barren landscape. In the forefront, one dog howls while another stands at attention. The two towers and dogs flank a long road that extends far out of sight. A lobster-like creature emerges from a pond onto this path. Not fit for human consumption under Biblical law, the lobster is a bottom feeder — the lowest of the low. It is embarking on a long journey to prove its worth, a reminder that perseverance is what leads to success, regardless of how others perceive your worth. 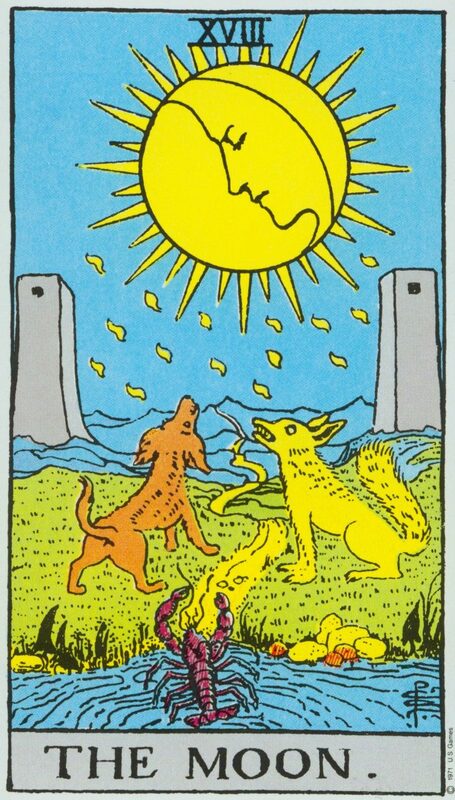 The Moon card appears to daydreamers and schemers. It represents those who feel the most strongly about how the world should be. While their vision may be clouded, they will stop at nothing to make those dreams become reality. If you are such an individual, at times you may find those closest to you untrustworthy. However, this is mainly due to your intransigent nature. Letting go of some control may earn you loyalty from your entourage. Upright, the Moon indicates that something in your life is not as it appears. This can also apply to your aspirations: your plans may not pan out as expected, and will most likely be derailed. Whether you’re in a relationship or single, the Moon indicates a desire for change. This could mean having a serious talk with your partner regarding your goals and needs, or even parting ways with someone who isn’t willing to change. While your love life may seem enviable to those outside of it, this veil of perfection should not blind you to your partner’s shortcomings. If you are single, don’t be over-eager — your love interest may have a hidden agenda or skeletons in their closet. You may find yourself unhappy with your job due to poor lines of communication. Start an honest dialogue with those around you. Clearing the air may be difficult, but it is important if you seek happiness in your career. If you are looking for a job, you may be feeling quite lost. Perhaps you have done schooling or training for one occupation, but have been unable to find steady work in your field. Don’t be afraid to explore new avenues — you’re bound to find something that brings you joy and a sense of accomplishment. Now is a time to be close to your money. Large investments are likely to backfire, as someone close to you is trying to take advantage of your financial situation. Listening to their advice will land you in hot water. The Moon typically indicates a poor state of mental well-being. It may be time to speak to a mental health professional as your feelings of anxiety or depression could very well be hindering your life journey. The Moon reversed is a positive sign. It indicates that the pain caused by a lie or self-delusion will soon subside. When in a relationship, the Moon reversed indicates that you are gradually coming to see your partner’s true colors. Perhaps they trust you enough to let their guard down, or maybe they are less virtuous than you once thought. Embrace the truth and do not wish for things to go back to the way they were before. If you love your partner at their truest, your relationship will flourish. If you are single, you may be pursuing a relationship with someone who can only do you harm. Proceed with caution. The Moon reversed is an indication that you have been experiencing a creative lull at work recently, and that this is holding you back. Try to approach your job from a different angle to see if there is any opportunity for improvisation. Your financial situation is about to take a positive turn. You may get a raise, or maybe you’ll be be offered a new job with a better salary and benefits. Seize the opportunity and lead from your gut. The Moon card speaks of your mental health and emotional stability. In the upright position it should be taken as a warning sign, while in the reversed position it announces calmer, brighter times. In the past position, the Moon indicates that you do not clearly understand the forces that have been at work in your life up until this point. Take a step back and reanalyze your past successes and defeats. Perhaps you had more of a helping hand from those around you than you realize. Self-aggrandizing stories of past accomplishments may in fact be doing you more harm than good. In the present and future positions, the Moon is a clear sign of change. You are or will be uncertain about how to proceed, but this situation will be less foreign to you than it may seem. Look to the past for guidance — you already have the experience you need to overcome this challenge if you are able to recognize it for what it is. When your vision of the future is inaccurate, you generally find yourself over-invested in pipe dreams and under-prepared for reality. When combined with another card, the Moon typically informs you on the accuracy of your intuitions. On its own, Strength symbolizes conviction, courage, and confidence. 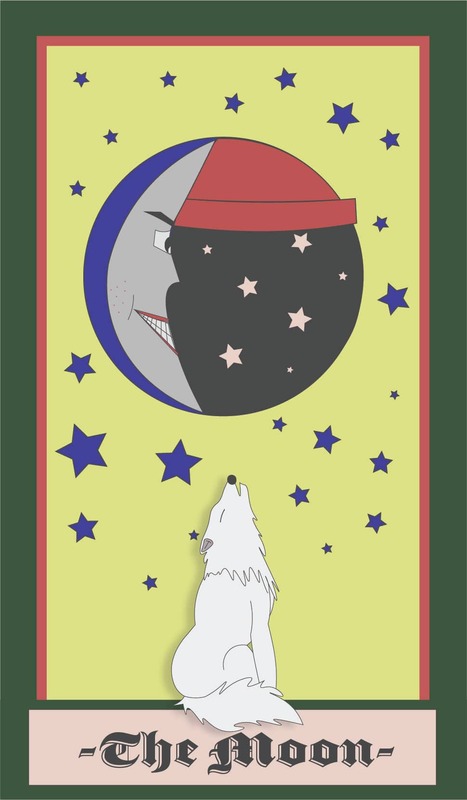 As the VIII and XVIII Major Arcana respectively, Strength and the Moon share a special bond. Together, they reward your single-minded perseverance. Your ability to focus and filter out the noise will allow you to bring about your vision of how your life and the world should be. The Wheel of Fortune indicates that you have a clear sense of your destiny. Luck is on your side — you may even receive more than you deserve. This is one of the better pairings with the Moon, as it signifies that your imagination and vision accurately depict upcoming events. As such, you are particularly adept at foreseeing trends. Alone, the Hanged Man is about the reversal of fortunes, self-sacrifice, and suffering. When paired with the Moon, it indicates that your desire for control is driving people away from you. Listening and learning from those around you isn’t a sign of weakness, in fact it may be the only way to succeed. The Devil signifies corrupt morals and unexpected disaster. When paired with the Moon, it becomes especially ominous — beware of manipulative people who will take what they need and then push you away. Identify those in your life who are draining your energy and time, and cut them loose. The Moon offers no clear answer in Yes of No readings. Instead, it should be perceived as a call for caution.